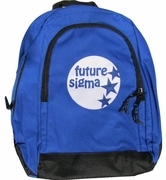 Carry it in style with our NEW designs on our Future Backpacks. Twill patch and symbols with embroidered lettering make our new backpacks a must-have for any Future Sigma. They measure 16" tall x 12" wide x 6" deep.